- Publisher First published in 1914, this text remains an indispensable tool for the serious student. 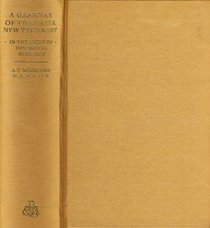 About "A Grammar of the Greek New Testament in the Light of Historical Research"
Archibald Thomas Robertson (November 6, 1863 - September 24, 1934) was an American biblical scholar born at Cherbury near Chatham, Va. He was educated at Wake Forest College and at the Southern Baptist Theological Seminary, Louisville, Ky. where he was thereafter instructor and professor of New Testament interpretation, and remained in that post until he died of a stroke in September 1934. In all, Robertson published 45 books, some of which are still consulted today, particularly his Word Pictures in the New Testament and his landmark volume A Grammar of the Greek New Testament in Light of Historical Research. Robertson helped found the Baptist World Alliance in 1900. He was an important Southern Baptist and a well-respected scholar in his day. Robertson sought to equip his students with the proper tools for good preaching.